A truly stunning setting for a delightful apartment on The Esplanade with one of the best views in Woolacombe from the large floor to ceiling patio doors in the open plan living room. The side entrance leads from the parking space into a small hallway. From here doors lead to the shower room, twin bedroom and the main living room with kitchen area. The twin bedroom has 2 single beds, wardrobe, dressing table and TV. The window is to the side. In the main room the spectacular view through the patio doors is breathtaking. Two armchairs, coffee table and dining table and chairs make up this lovely open plan room. The kitchen is fresh, white and modern with integrated dishwasher, washing machine and fridge/freezer. 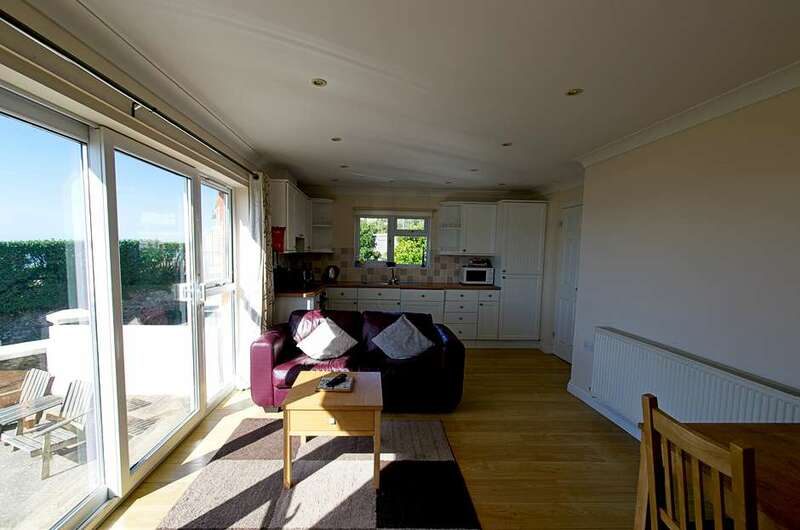 With off road parking for one car and a lovely enclosed private patio area, this is a great choice for 2/3 people for a holiday by the sea at any time of the year. There is a fold up guest bed provided for a third person to sleep in the living room (no linen provided for this).